Originating in China, qigong dates back nearly 5,000 years. The name derives from the Mandarin words qi, meaning energy or life force, and gong, meaning work or skill. It is a mind-body practice as well as an energetic form of movement done to enhance the flow of qi in the body. By integrating posture, body movements, breathing and focused intention, this practice is designed to improve mental and physical health. Though its roots date back before Traditional Chinese Medicine (TCM), it has been incorporated into the system of practices that TCM practitioners use today. The existence of qi – an energy force that can move through, yet exist independently of the body – is controversial in the West, as it does not lend itself to independent verification and analysis via scientific instruments. The skeptical view of qigong holds that any health benefits it conveys are due to the acknowledged benefits of gentle exercise, the placebo effect, or both. What conditions is qigong used for? Qigong can be used by nearly everyone. Bill Douglas, founder of the International Health Education World T’ai Chi and Qigong Day, who is also Dr. Weil’s expert advisor on the therapy, recommends qigong as a highly effective stress management tool. Along with decreasing daily stress, he contends that qigong may boost immune system function, improve balance, tone the cardiovascular system, lower blood pressure and modulate disorders of mood. Different forms of qigong have a unique focus, each with varied indications. 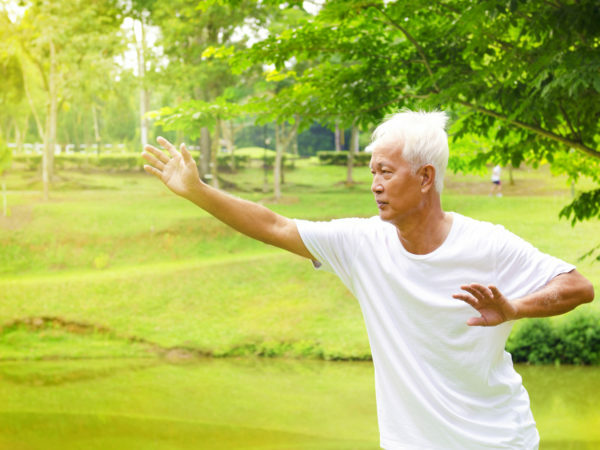 For instance, medical qigong concentrates particularly on improving qi to strengthen the body’s organs, tissues and systems (respiratory and immune, for example) for the purpose of achieving optimal health and lessening the effects of aging. Spiritual qigong is done to lead the individual closer to his or her spiritual source, whatever they presume that to be, and to enhance those cultural and religious practices with which they align themselves. Martial qigong, better known as tai chi, is used to increase strength, flexibility and balance by bringing qi into the muscles, bones and tendons through specifically designed routines. What should one expect on a visit to a practitioner of qigong? Qigong is done as either a movement practice or hands-on therapy. The movement practice is typically taught in individualized or group settings by a qualified teacher. Qualifications can be ascertained by looking into the teacher’s training and medical background. Those with TCM training are often well-suited to teach medical qigong. Videos can often be effective teaching tools and useful alternatives when one can’t find the right instructor. Hands-on medical qigong is similar to other forms of touch therapy. The patient dresses in comfortable clothing and sits or lies on a massage table. The practitioner will apply hands on or in front of various places along the body where “energy blockages” are discerned. Slow, deep breathing is encouraged, and sometimes a practitioner may recommend certain guided imagery exercises or visualization during therapy. Heat may be felt at the site of treatment, usually coming from the hands of the practitioner. Afterwards, feedback may be requested about the therapy and home exercises may be recommended. Due to the deep states of relaxation that energy work can often cause, one should always be cautious and get up slowly after a treatment and drink plenty of water afterward. Are there any side effects or situations where qigong should be avoided? Bill Douglas has taught qigong to professional athletes, corporate executives, maximum security prisoners, drug rehabilitation patients, the wheelchair-bound, elderly individuals with advanced Parkinson’s disease, children with ADD, students with learning and developmental disabilities, and people with AIDS. Anyone with an existing condition is well advised to consult their physician before beginning any exercise program, but qigong is an extremely gentle practice; it does not even necessarily require the individual to stand, as many movements can be done while sitting. Consequently, it can often be used for even the most delicate conditions with minimal, if any, side effects. Is there a governing body that oversees or credentials practitioners in qigong? At present, there is no international standard for certifying qigong practitioners. An ongoing effort to set standards has involved several countries, orchestrated by the World Academic Medical Qigong Society in Beijing. However, a standardized program of training in qigong has yet to be agreed upon. Two organizations provide direction in finding practitioners and training programs. The International Institute of Medical Qigong (IIMQ) offers training programs and certification based on a curriculum from the Medical Qigong College at Haidian University in Beijing, China. The National Qigong Association (NQA) also offers professional certification for their members as an opportunity to enhance and highlight the experience of affiliated practitioners. Both organizations offer databases to help in locating practitioners. Are there other therapies that might work well in conjunction with qigong? Qigong is often used within the system of TCM, which includes treatment modalities including acupuncture, Chinese medicinal herbs, and aspects of a Chinese system of bodywork called Tuina. Craniosacral therapy and other forms of osteopathic or chiropractic manipulation along with other types of bodywork can work well with qigong. Other mind-body therapies and stress management strategies like breath work, guided imagery and visualization can also meld well with qigong practices. What is Dr. Weil’s view of qigong? Dr. Weil recommends both qigong and tai chi as part of a program of health maintenance that is suitable for nearly anyone. In any city in China you can see thousands of people of all ages practicing these movements throughout their day. He believes that qigong promotes flexibility, balance, and good body awareness. It is beautiful to watch and to do, and may be particularly good for the elderly because it can reduce risk of injury from falls.